Q I’m having a lot of trouble finding an organic rat block or any premixed rat food. Currently I feed organic fruits and vegetables and baby food and cereals on a daily basis. Truly, I’ve had the most luck and health this way rather than feeding rat pellets and regular fruits and vegetables with prior rats. If you could help me with this problem, I would love it. Thank you so much. A I’ve never heard of any. To be 100% organic, you will have to make your own mix. Normally if you make your own mix, dog food is one of the ingredients used along with fresh items, grains, seeds, cereals, etc. Feeding rats can be done either by using a lab block that has all the nutrients needed by rats in the amount they need, to making your own from one of the homemade mixes fanciers have come up with. With making your own mix you can control what is organic and non-GMO but you can run into too high or too low of a particular vitamin, mineral, or other item. It depends on your situation and what the rats are used for as a couple pets would be different than a breeder with many animals with pregnant and nursing moms, growing babies, etc. With this diet, nothing was mentioned about using different grains or seeds along with the above, so it was dog food, milk, veggies, liver, and water. This mix was cooked in a 50-gal. steam cooker for about 1 hour or until the water boiled away and the food was fairly dry. It was spread on trays to cool. The food could also be put through a meat grinder to form macaroni-like strands. It was then placed on wire screens and dried in a hot room. This made a diet that was excellent for feeding over the weekend and kept indefinitely. They varied the diet 3 days per week to include other items such as bone meal, powdered eggs, meat, liver, kidneys, heart, or tomatoes and salmon in place of the fish. This amount was used to feed 900 to 1000 rats once daily (9 rats got a 1-quart scoop) with double portions on Saturday. They stored one-week’s worth of dry ingredients in metal containers in dry conditions and normally sterilized the food before use. This sounds very similar to a lab block but with this one they don’t mention any fresh items being used. Feeding rats can be varied. Also, lab blocks come in many brands and formulas so if you’ve tried a pet shop brand and wasn’t satisfied, then try one of the high-quality lab brands (Teklad, Purina, Mazuri, etc.) 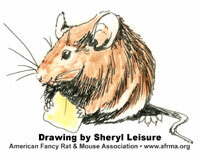 as most owners and breeders found their rats like the high-quality ones best. Q I am looking for organic mice food, let me know if you have any options. A Sorry, but we don’t know of anyone making organic mouse food. Some pet owners will make their own mix of various seeds/grains/cereals, etc., with organic foods they buy in the grocery store. You should try Teklad or Purina to see if they could help you since they both do custom diets.